Part of the Diocese of Shrewsbury covers the ancient Diocese of Hereford and this is reflected in the present-day diocesan crest featuring the inverted head of a leopard, the standard of St Thomas of Hereford that denotes his decision to turn away from warfare in the pursuit of peace. St Thomas Cantilupe was born in 1218 at Hambledon, near Great Marlow, Buckinghamshire, into an eminent Norman family which came to England with William the Conqueror. His father was steward of King Henry III’s household and his mother, Millicent de Gournay, was dowager Countess of Evreux and Gloucester. His education was entrusted to his uncle Walter, the Bishop of Worcester, who sent him to Oxford when he was 19. He then went to Paris with his brother, Hugh, before joining his father at the 13th General Council in Lyons where he was probably ordained. He also received a dispensation to hold a plurality of benefices from Pope Innocent IV of which he freely availed himself. After reading civil law at Orleans he returned to Oxford to lecture in canon law and in 1262 was appointed chancellor of the university. He was charitable to poor students but was also a strict disciplinarian, confiscating arms carried by undergraduates divided into camps of northerners and southerners. Politically, St Thomas sided with the barons against Henry III and was among those sent to plead their cause to St Louis at Amiens in 1264. When the King was defeated at Lewes St Thomas was made chancellor of the kingdom but he was dismissed after the slaying of Simon de Montfort at the Battle of Evesham in 1265. St Thomas, then aged 47, retired to Paris but returned to Oxford some years later. 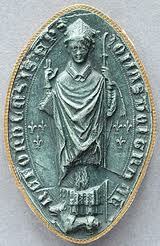 In 1275 he was made Bishop of Hereford and he was consecrated at Christ Church, Canterbury. During the ceremony he expressed his annoyance that the Welsh bishops had decided not to attend. Soon afterwards, the saint began to reform his diocese, rebuking and excommunicating “public sinners”, particularly those in high places who by their example were giving scandal, and he also strove to overcome spiritual and temporal lords who attempted to encroach on his possessions. As he travelled throughout Hereford St Thomas would also ask every child he met if they were confirmed and then would immediately administer the sacrament himself if they replied in the negative. His final years were marked by grave dissention with John Peckham, the Archbishop of Canterbury, first on general questions of jurisdiction and then on particular cases within the Diocese of Hereford. St Thomas pleaded on behalf of aggrieved suffragans at a synod in Reading and Rome eventually gave them the reliefs they asked. But during the dispute St Thomas was excommunicated by Archbishop Peckham. He immediately appealed and set out in person to meet Pope Martin IV about his case. He was received kindly by the Pope at Orvieto and withdrew to Montefiascone pending consideration of his cause. The heat and exhaustion of the journey proved too much for St Thomas, however, and he was taken mortally sick and died on 25th August 1282. He was later vindicated by Rome. St Thomas was buried at Orvieto but his relics were later conveyed to Hereford where his shrine in the cathedral became the most frequented place of pilgrimage in the west of England. Source: Butler’s Lives of the Saints.